What could I do to fix it? I have already cleaned the bolt face well to remove any carbon and dirt. Do I need to change the recoil spring or have the extractor worked on in some way? Is the bolt loose in the slide? Mine will do that if/when it gets dirty. Before you pull your hair out, start with a thorough cleaning and light lube. You would be surprised how much that can help. If not do a search on that , there are reams of info on that subject. I know because I went through the same problem. OK, I'll ask the painfully obvious question... what ammo are you using? S&W41s can be quite finicky on ammo selection (not all, but some more than others). quality ammo in mine (Wolf Target, SK, Eley) and it does not feed as reliably as the CCI. If not using CCISV, I use a light coating of paste was for reloading on my bullets, applied with my fingers when loading the magazine. Federal Autoloader was a problem for me until I tried this. My mid 80's 41 has a Volquartzen extractor, 6.5lb recoil spring and it's never had an alibi. That's with 3 different barrels. I'd consider switching the extractor, getting a 6.5lb spring and running CCI SV. Also give that chamber a good cleaning and ditch the lubing of the bullets IMO. I started shooting a S&W 41early in my shooting career. Switched quickly to a Hammerli Walther Olympia, Walyther GSP & Pardini SP. The Walthers digested any ammo without a hiccup. The Pardini worked very well with Wolf MT/SKJagd ammo but not as reliably with other ammo. The 41 worked well with some batches of CCISV and not as well with others. I traded the 41 early in the game. Doug Tiedt wrote: OK, I'll ask the painfully obvious question... what ammo are you using? I am using CCI SV (100rd plastic box) Ammo exclusivity. I gave it a quick scrub on the bolt face with a tooth brush at the range and that did help a bit. Before I cleaned the bolt it would jam about 1in 10 shots. Now it is just jamming 1 in every 20 shots. It did not appear to be very dirty before I cleaned it so the pistol must be a bit sensitive. I loaded an empty case into the chamber and sent the bolt home to see how the extraction looked when I pulled the slide back by hand. It won’t extract the case at all!! I have to get a cleaning rod to pound it out from the muzzle end! I suppose that I will need to clean the chamber also as part of the cleaning process. I shot smallbore rifle for a few years with an Anschutz and never had to worry about anything like this. Did you use an unfired brass and remove the bullet or a fired round? No surprise at all if a fired round did not want to come out. Pull slide off gun, take a round and slide it under extractor , what does tension feel like, is the extractor tip contacting the case anywhere ? Before changing any parts, I recommend trying the “drop of oil trick”: put on drop of oil on the first cartridge of each magazine. Put it right where the bullet meets the case. Do this at the range right before shooting (In time the oil can seep into the cartridge and spoil the powder). So only dothis right before you shoot. I have two 41’s: on new and one from the 80’s. Both exhibited the problem you described and both were cured with the oil trick. Keeping the gun clean, as others have indicated, is important too. But the oil drop trick is magic. Scott10x wrote: Before changing any parts, I recommend trying the “drop of oil trick”: put on drop of oil on the first cartridge of each magazine. Put it right where the bullet meets the case. Do this at the range right before shooting (In time the oil can seep into the cartridge and spoil the powder). So only dothis right before you shoot. I have two 41’s: on new and one from the 80’s. Both exhibited the problem you described and both were cured with the oil trick. Keeping the gun clean, as others have indicated, is important too. But the oil drop trick is magic. oil drop is a bandaid to a gun that needs repair or tuning. The "drop of oil trick" will increase pressure by introducing a non-compressible liquid into the chamber and will increase slide battering in a blow back action, which rely on a certain amount of case/chamber adhesion to slow the mechanism down. The "drop" of oil isn't to add oil in the chamber. It is to oil the bottom of the bolt. 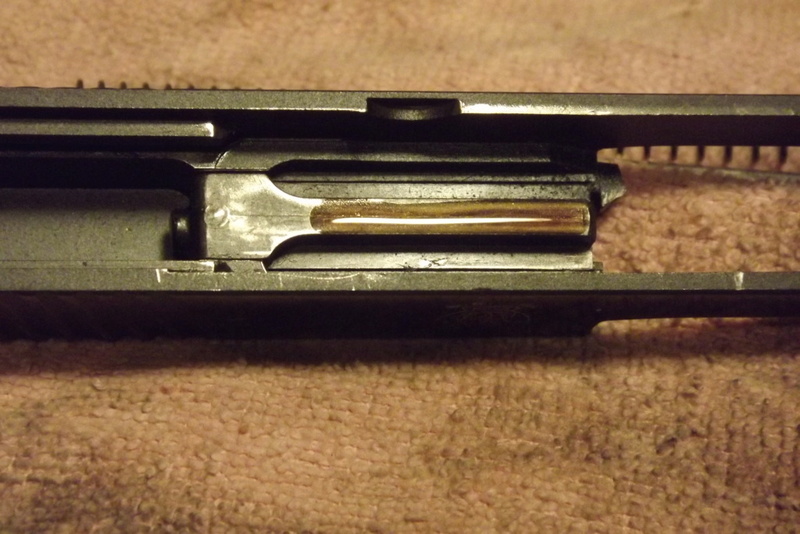 If it bothers you to get the oil on the bolt indirectly then add a drop into the magazine well. You can do a much better job by turning the pistol upside down and letting a drop fall onto the bolt. No one seems to have a problem with keeping the action well oiled. There will still be a little oil transfer to the top bullet in the magazine but any well oiled pistol gets a little splatter. Len This was my opinion of course..
Another way to skin that cat....I polish the bottom of the bolt, curve and polish the rear edge like you would a M1911 firing pin stop and polish the top of the hammer. You get the same result I believe. As I typically use Eley ammunition, I try not to use too much oil as it can leave as much deposits behind as black powder (minor exaggeration). The first thing to do is install a new recoil spring. They wear, they shorten, it does strange things to the timing. I installed new springs on my M46 and M41. It is my recollection I had a few stove pipes before I changed springs. I do remember a shooter in an indoor match, his M41 was having failures to eject, and I loaned him my used M41 recoil spring. His pistol stopped malfunctioning. 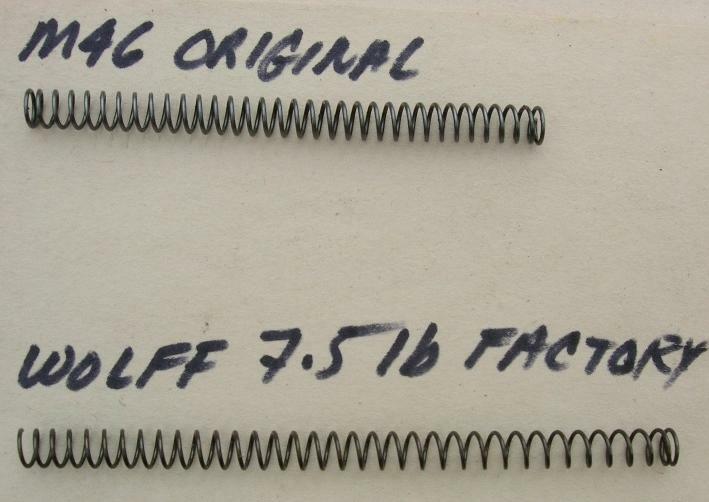 A comparison of his spring to my used M41 showed a significant reduction in length. So, first thing, new recoil spring, go shoot some good ammunition. If that does not fix the problem, the next step would be a worn extractor/extractor spring. The extractor does not extract the round, this is a blow back pistol, the round is popped out during the residual blow back period, but the extractor does hold the case against the breech face during recoil. If the case falls off, because of a worn extractor or weak spring, that will cause a stove pipe. Also, a new mainspring. Weak hammer strikes will cause weak ignition, which will cause stove piping. 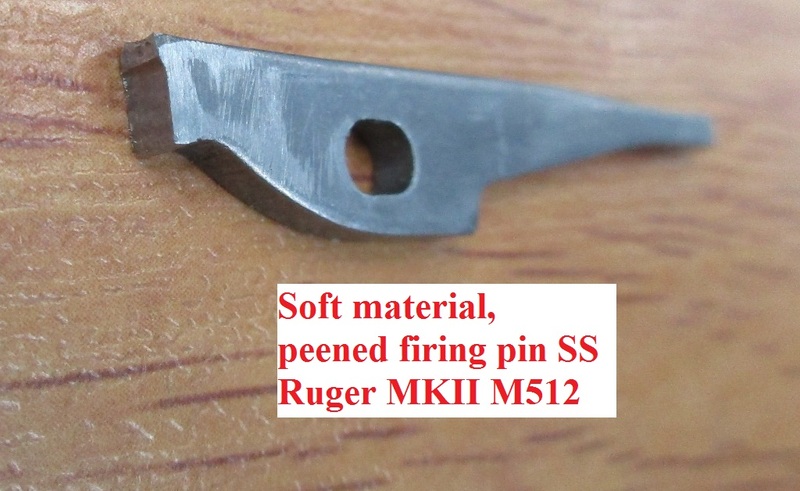 I had weak firing pin strikes with a Ruger MKII in stainless. The firing pin was soft, mushroomed and peened at the end where the hammer hit it. That caused stove piping and failures to eject. If the primer compound is not hit hard and fast, ignition is not robust. A Volquartsen tool steel firing pin fixed all ills. Ruger pistols have massive mainsprings, but I think the excellent trigger pull in the M41 is partially due to a weaker ignition system. Therefore having a new, strong, mainspring, is just an excellent idea for function reliability. Those are three simple fixes and worth doing before any heroic measures. Tell us what the fix was. Slamfire's post should be a "sticky".
" The extractor does not extract the round, this is a blow back pistol, the round is popped out during the residual blow back period"
Well it really is an extractor and does extract the round. Yes, it pops out when fired but it also has to be able to extract the bullet when not fired. Over on Rimfire Central, there is often a debate about this drop of oil trick which boils down to "a well tuned gun with fresh ammo should cycle without this added lubricant" vs. "Clark advises it for their barrels, so they must know what they are doing". My 41 was tuned by a capable pistolsmith and doesn't currently need the drop of oil (with CCI, Eley or SK), so I am curious what does it specifically do? Hopefully there is more to it than "it just works" or "we've been doing it that way for years".